Sunday February 3rd 1895 It was a very cold day. We were not away from home. I spent the spare time in reading. David was in town awhile. Will does not feel very well. Monday February 4th 1895 I was busy about the work all forenoon. It was a very cold day but we went over home in the afternoon I found Ida and Nellie had gone this morning. Fanny was up and we helped quilt all afternoon. Came home in time to do the evening work, read all the evening. Tuesday February 5th 1895 I got an early dinner and Will took me over home. It was a very cold day. David went for wood in the afternoon. I knit and read in the evening. Wednesday February 6th 1895 I was busy in the kitchen all forenoon. After an early dinner David went for wood. It snowed so in the afternoon that we did not go in town. I finished a pair of socks I was knitting for Will and began mittens for myself. 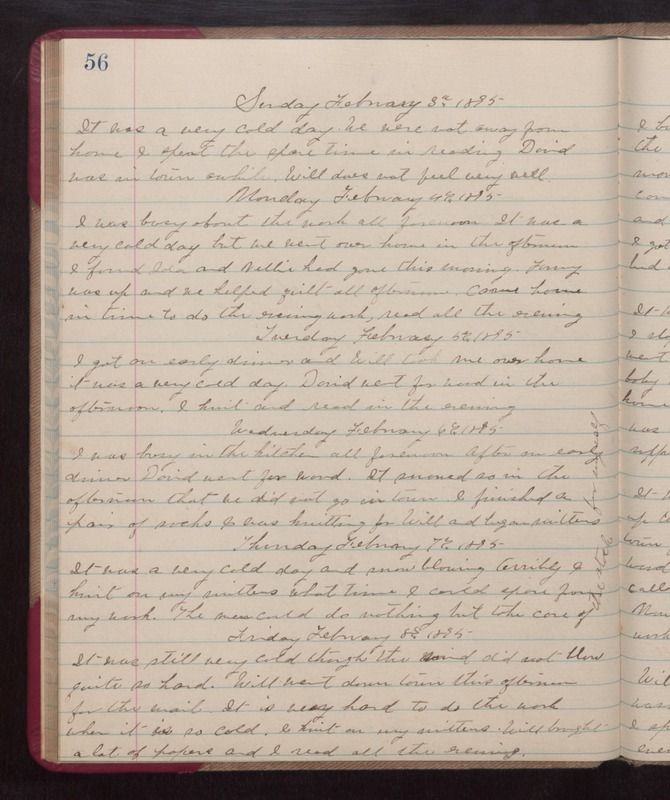 Thursday February 7th 1895 It was very cold day and snow blowing terribly. I knit on my mittens what time I could spare from my work. The men could do nothing but the care of the stock. Friday February 8th 1895 It was still very cold though the wind did not blow quite so hard. Will went down town this afternoon for the mail. It is very hard to do the work when it is so cold. I knit on my mittens. Will brought a lot of papers and I read all the evening.